Do you have a favorite accessory? A hand bag, scarf, shoes, necklace or watch. Why not make it your glasses? There are so many options in eyewear. A new glasses shape can transform your look instantly. The material and color can change it from a formal sophisticated look to uniquely trendy. Glasses for a specific task like computer, reading, or sun wear is a great time to experiment with new looks. Jamison Optical has your next accessory waiting for you. Jamison Optical is located in Eden Prairie 55344, 7912 Mitchell Road. We are here to help you find your next accessory. Dr. Pei Ling Jamison and her staff will ask you questions about your lifestyle to find what type of glasses are needed to accessorize your vision. Jamison Optical wants year everyday eyeglasses to reflect who you are. We can achieve this by the style of glasses we pick. Dr. Jamison likes traditional and tailored looks. One of her favorite lines is Modo because of the minimal metal frame with a little bit of color to accent. A one of a kind and architectural frame can be the accessory you are looking for, then try our Ziggy Eyewear. For beautiful blending of colors, we have tortoise plastic frames from Prada and Dolce Gabbana. Large bold plastic frames and more rounded is trending currently but let Jamison Optical help accessorize what will be best for your look. Specific reading and computer glasses can become a fun accessory. Computer glasses can be more unique because you many not wear them all the time. We can try a bolder color like red or vibrant blue. A plastic frame will be more noticeable on the face which could give a more interesting look. Maybe you want to be more serious during meetings, then a sophisticated pair of glasses is in order. For a simple and classic look, glasses with eye wire or a metal frame in a neutral tone will look more sophisticated. Sunglasses have been an accessory for many years. From style icons like Jackie Kennedy Onassis to modern day reality stars like the Kardashian sisters, there are endless options for sunglasses. Large sunglasses are being seen on many celebrities. For a more glamorous look, get sunglasses with bling on the side or temples that are not straight back. Go with an aviator style for a sportier look. For the best vision during extreme glare, snow, and water conditions, try Maui Jim. We cannot forget the classic Ray Ban Wayfarer which is a great hipster accessory. Jamison Optical has many different sunglasses for your next new pair of sunglasses. Let Jamison Optical help you find your next accessory. Our address is 7912 Mitchell Road, Eden Prairie MN 55344. Our hours are Monday 9 am – 5:30 pm, Tuesday 9 am – 7 pm, Thursday 9 am – 5:30 pm, Friday 9 am – 5:30 pm. We accept many insurance plans. 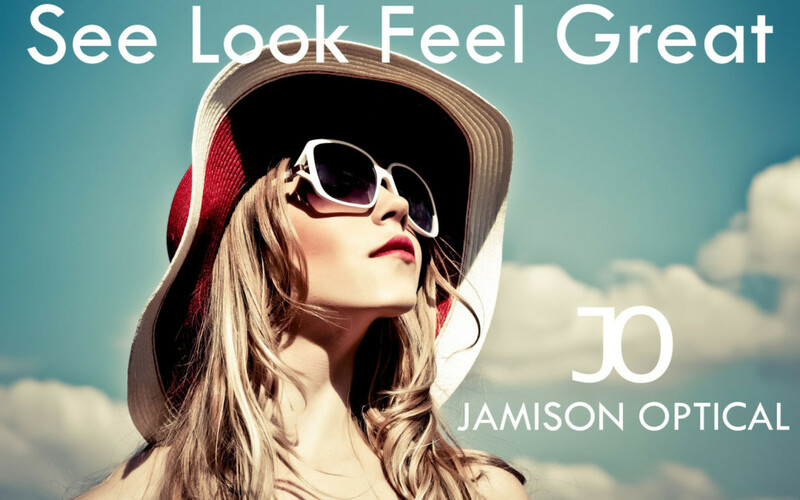 Call to book an appointment (952) 934 – 2084 or online www.jamisonoptical.com.